Dara Randerson (left) readies a Skyranger Drone with colleague Maurice Nutall. Dara Randerson always wanted to learn to fly. When, in 1998, her husband, Robert, presented her with flying lessons for Christmas, an elated Dara jumped at the opportunity to make her childhood dream come true. Dara Randerson with Adam Goffinet. Three years after her Christmas surprise, Dara graduated with a license to fly single-engine airplanes. In 2014, after sending her youngest child off to college, Dara accepted a position as a senior engineer at ComEd as part of the team that ensures reliable power in the northeast corner of the ComEd service territory. 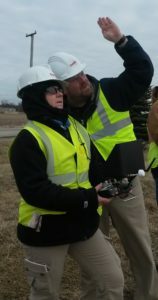 She had already earned a bachelor’s degree in mechanical engineering from Purdue University Northwest in Hammond, Ind., and a master’s degree in education from Dominican University in River Forest, Ill.
That year, ComEd became the first energy delivery company in the nation to be granted permission by the Federal Aviation Administration (FAA) to operationally use drones. ComEd uses the flying technology, which comes equipped with cameras to shoot video and take photos, to inspect parts of its more than 90,000 miles of power lines positioned high above ground. When Dara learned that ComEd was researching the technology, she volunteered to join the team. At that time, a FAA pilot’s license was required to fly. Since September 2016, the FAA now requires a Remote Pilot in Command (RPIC) license for all unmanned aircraft pilots who fly for business-related purposes. Dara has since tested and earned the RPIC license. “Know Before You Fly” is an educational campaign that provides prospective users with the information and guidance they need to fly safely and responsibly. Drones are controlled by joysticks, much like the ones used for video games. Dara, not being much of a video gamer, said she spent hours practicing to use a joystick well enough to control the drone. Piloting a drone is serious business. Drones run on battery and, in the case of ComEd drones, possess rapidly spinning propellers. They can be dangerous in untrained hands, she says. Currently, Dara is the only female drone pilot on ComEd’s limited, all-volunteer team, but another female is training to join the team later this year. Dara says drawing more women into careers in STEM (science, technology, engineering and math) requires getting them interested in the basics while they are young. Dara counsels high school students interested in STEM careers and serves as a mentor for ComEd’s Icebox Derby, a hands-on learning program designed to educate and empower young women to explore opportunities in STEM.